The National Chairman of the All Progressives Congress (APC), Adams Oshiomhole, addressing the press. 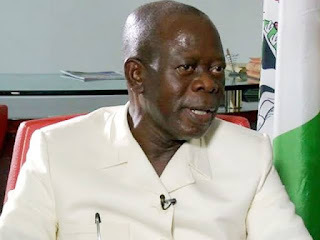 The National Chairman of the All Progressives Congress (APC), Adams Oshiomhole, has alleged that the Independent National Electoral Commission (INEC) is working for the opposition Peoples Democratic Party (PDP). Mr Oshiomhole made the allegation at a press briefing in Abuja on Wednesday. He was reacting to allegations by the PDP that the APC is behind the fire incidents in INEC’s offices in different states of Nigeria. “INEC is working more for PDP. I can show,” Mr Oshiomhole said. He cited the commission’s decision to ban APC from presenting candidates in Zamfara State as one of the evidence of INEC’s alleged collusion with the PDP. “INEC without giving us any explanation and without giving any concrete evidence went ahead to say that we can’t field candidates in Zamfara State, therefore, seeking to annul democracy in Zamfara State,” the ruling party chairman said. Contrary to Mr Oshiomhole’s claim that INEC gave it no explanation on Zamfara, PREMIUM TIMES reported how the electoral commission wrote the APC on its decision in Zamfara. The electoral commission said it took the decision to ban APC because the party did not hold its primaries within the stipulated period. Speaking on the fire incidents in some INEC offices, Mr Oshiomhole said it is the APC that should be alleging the PDP is responsible for the fire incidents. “If anything, we are the ones that should raise suspicion that the states where these incidents have occurred are in states where PDP is not in office,” he said. Mr Oshiomhole said if PDP chooses to make allegations, they are free, but the APC would not join them and be distracted. PREMIUM TIMES reported the fire incidents in INEC offices in Abia, Plateau and Anambra states. Of the three, Abia is governed by the PDP, Plateau by the APC and Anambra by APGA. The party chairman also alleged that two resident electoral commissioners (RECs) in the South-south states were working for the PDP. Mr Oshiomhole, however, did not name the RECs or the states. All but one of the six states (Edo) in the South-east is controlled by the PDP. Mr Oshiomhole urged the electorate to vote for President Buhari and other APC candidates, saying the APC-led federal government has done a lot and needs to be supported to do more. He gave several reasons why the electorate should not think the PDP has changed and will do better than it did in the 16 years it held power at the centre. He described the PDP as old wine in “old poisonous wineskin”. He also said Mr Buhari was a victim of rigging under the PDP and so the PDP is not in the moral position to accuse him of planning to rig. “Muhammadu Buhari who has been the victim of election rigging three times before he got the fourth one. Speaking on the crowds that greeted the PDP in states believed to be APC strongholds like Kano and Lagos, Mr Oshiomhole said PDP’s crowds were rented. He said his party is not jittery and predicted this will be the easiest election for the ruling party. “This election is for us, no election can be easier and we will defeat PDP. There will be no violence, just vote, it will be counted and we will win."